While other countries still debate high-speed rail, it is already reality in China. But have recent corruption allegations and growing concerns about the safety of the high-speed rail network cast a shadow that could prevent future progress of the projects? Elisabeth Fischer reports. The opening of the Beijing-Shanghai high-speed link was described as a new chapter by Chinese Premier Wen Jiabao. High demand at the opening of the Beijing-Shanghai service: travellers at the security check-in. Map showing China's planned high-speed rail lines that form the country’s national grid. As of June 2011, 9,676km of Chinese high-speed tracks are in operation - and plenty more are to follow. A corruption scandal and increasing concerns about the safety of the high-speed network have cast a shadow over the development of railway projects. When China’s Premier Wen Jiabao boarded the first bullet train to open the service of the new high-speed line between Beijing and Shanghai on 30 June 2011, he described the step as a ‘new chapter’ in China’s railway history, with great significance for the improvement of the country’s transportation system and social and economic development. While other countries argue about the pros and cons of high-speed rail, it is already reality in China. More than 130,000 construction workers and engineers worked round the clock to complete yet another one of the country’s high-speed lines. Only 38 months after breaking ground in April 2008, the first bullet train on the 1,318km-long high-speed line left Beijing on route to Shanghai. Accelerating to 300km/hr about ten minutes after leaving the capital, the new line connects China’s two major metropolitan hubs in only four hours and 48 minutes – compared to about ten hours on the old railway. Originally designed for speeds up to 380km/hr, the Beijing-Shanghai train speed blows away not only France’s TGV, which runs from Lorraine to Champagne and averages 272km/hr, but also China’s first high-speed train on the Beijing-to-Tianjin route that averages 230km/hr. After opening the world’s fastest high-speed line in January this year, connecting Wuhan-Guanzhou with an average speed of 394km/hr, China seems to be on track to a high-speed rail revolution. "In the years ahead, China will unveil many key links to form a bullet-train network stretching across the nation." China’s high-speed network has progressively increased over the past few years. As of June this year, 9,676km of tracks are in operation – and plenty more are to follow. By December, the Beijing-Wuhan line will complete the north-south route between the border to Hong Kong and China’s capital. Also by December, the final links of the 2,078km east-west route between Shanghai and Chengdu will be operational, connecting China’s economic capital with the country’s fourth most liveable city. In the months and years ahead, China will unveil many key links to form a bullet-train network stretching across the nation. The government is set to spend $113bn a year on railway infrastructure and rolling stock in the next four years, all funded under an ambitious build-out initiated by the 2004-2020 mid and long-term railway development plan by China’s Ministry of Railways. The $293bn plan envisions 16,000km of dedicated high-speed rail lines connecting all of China’s major cities by 2020. By then, the total rail network would accumulate to 120,000km, but some observers consider it rather closer to 150,000km. World Bank Beijing senior transport specialist John Scales described China’s efforts in The Times as the biggest rail expansion the world has ever seen. "Historically, this is the only country that has ever attempted such an increase." But while China’s growing high-speed network is highly acclaimed by some industry members, it is also riddled with safety problems and corruption concerns. "While China’s growing high-speed network is acclaimed, it is also riddled with safety problems and corruption concerns." The new year started off with a bang when then Railway Minister Liu Zhijn was sacked in February over alleged ‘severe violation of discipline’. He had to face accusations that $121m was embezzled under his eight-year administration, casting a shadow over the powerful Railway Ministry. Sheng Guangzu, who followed Zhijn in his role as Railway Minister, had to defend the high-speed programme from a barrage of criticism as calls for the government to reconsider its investment were raised. When investigators found evidence that nearly $30m of funds budgeted for the Beijing-Shanghai line was misappropriated in the course of 2010, they initiated an intense safety review of all projects. Financial regulators in Beijing cautioned banks to monitor their rising exposure from loans to the rail ministry, where the ministry had borrowed more than $300bn to pay for the rapid deployment of the network. The corruption scandal, as well as the speed with which the tracks have been built, sparked not only an outcry in the industry but also fears over the poor quality of the lines, which were meant to carry trains travelling at up to 380km/hr. Chinese and foreign engineers alike started questioning the long-term strength of the tracks, especially of the concrete used in bridges and viaducts under contracts awarded during the term of Liu Zhijun. As a result, several major changes were announced by the new minister, one of which was that trains on the Beijing-Shanghai line would be slowed down from 380km/hr to 300km/hr, increasing safety and also reducing operating costs. Despite the concerns about the safety of the tracks, industry experts name numerous benefits of China’s massive expansion plans and as a clean way to boost the expansion of the country’s transportation system. Building railway tracks is seen as preferable to expanding the dependence on imported oil for automobiles and airplanes. Rail demand in China is progressively growing and expected to more than triple to five billion passengers a year by 2020. The high-speed network is not only expected to ease congestion on conventional lines but will also have a positive impact on freight transportation, and boost productivity throughout the economy. "Rail demand in China is growing and expected to more than triple to five billion passengers a year by 2020." "In essence, China’s big infrastructure networks are platforms upon which new industries are layered, greatly multiplying the economic value of the projects themselves," writes Boston Consulting Group’s Beijing office senior vice president and director David C Michael in Bloomberg Businessweek,in February this year. "They create new markets by making it easier to reach consumers and stimulating new customer needs and behaviour. And they redraw the economics of operating in China, reducing shipping costs and making new locations more attractive for business." Michael describes the impact of the high-speed network as "far-reaching and transformative", driving up productivity, reducing passenger travel times and opening up Chinese markets and people to new opportunities. The high investment costs, which have been estimated to be $32bn for the Beijing-Shanghai line, are said to be partly paid back through lower operating costs. Instead of laying rail on wood or concrete sleepers set into crushed rock, the Chinese high-speed network is almost exclusively set into beds of concrete slabs designed by German rail engineering companies. This eliminates damage to the track and rolling stock caused by flying stones lifted by the trains and reduces wear on the wheels from shifting tracks. Nevertheless, the prices of the fares are soaring, sparking more criticism. Economy class tickets for the high-speed lines are comparable to discounted plane tickets and simply not affordable for ordinary citizens who still will have to board the older and much slower diesel trains. China’s officials have acknowledged the shortcomings of the current system. "The $293bn plan envisions 16,000km of dedicated high-speed rail lines connecting all of China’s major cities by 2020." Premier Wen Jiabao said at the inauguration of the Beijing-Shanghai line at the end of June that railway officials and managers still face arduous tasks to ensure the operation is safe, orderly and efficient. "Railway departments must give top priority to the safety (of operation) while continuing to improve their service quality," he said. In spite of all concerns, China’s railway officials have not stopped promoting its revolutionary plans for the future and plans to link the country’s high-speed rail network to cities as far as London, Berlin, Moscow, New Delhi and Singapore. China would provide technology, equipment, trains, and even construction costs for countries that are willing to supply natural resources. Seventeen other countries in Asia and Eastern Europe should be connected to the infrastructure in China, setting the framework for what could be the largest infrastructure project in history. How the programme will progress, however, is determined by the success of the high-speed network in China itself. And a corruption scandal and safety concerns might not help in this case. 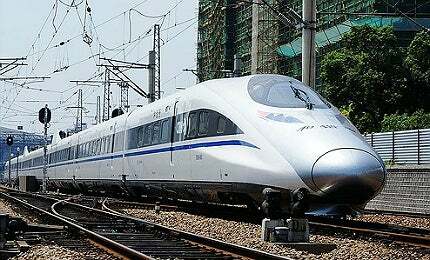 CRH380A is high speed rolling stock which was developed by the China South Locomotive & Rolling Stock Corporation (CSR). Despite a hostile economic climate, many developers are moving ahead with the next generation of high-speed rail lines.